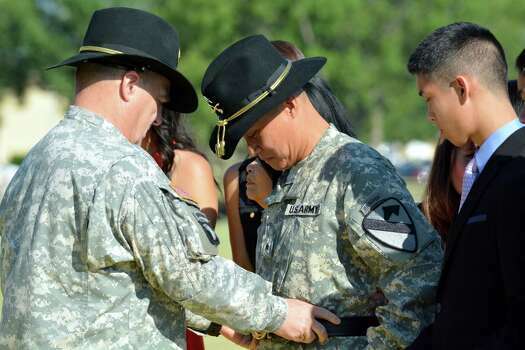 FORT HOOD, Texas — A Fort Hood soldier whose family came to the United States as refugees when he was 10 became the first Vietnamese-American to reach the rank of general in the U.S. Army on Wednesday. Col. Viet Luong received his brigadier general's stars from the Fort Hood commander, Lt. Gen. Mark Milley, at a ceremony Wednesday at the Central Texas Army post. Luong and nine other family members escaped South Vietnam on a flight during Operation Frequent Wind in 1975. After a stay at a resettlement camp in Fort Chaffee, Arkansas, the family settled in Los Angeles, the Killeen Daily Herald reported. Today, he is the 1st Cavalry Division deputy commanding general for maneuver and the first Vietnamese-born officer to reach the position of general staff or flag officer in the U.S. military. "The journey was arduous," he said after his wife pinned his new stars on him. story of our nation and what it stands for," he said. "I'm a symbol of democracy, freedom and the justice of our Constitution," he said. Among the hundreds attending the ceremony were Luong's seven sisters, his mother, wife and three children. "Viet and sisters are Americans now by choice," Milley said. "He has served this great nation honorably over the last many decades. ... There's no one in uniform today that epitomizes what it takes to be an American soldier more than Viet Luong." Luong commanded combat troops in Iraq in 2006-08 and Afghanistan in 2009-10.